If there has to be one resource that God gave to the inhabitants of the Holy Land, it should definitely be the Sun. The sun that dries up, that makes the waters of the Dead Sea and the Kinneret evaporating at an alarming rate, but also the one that provides the vital energy to cook meals, brings light when the sky darkens and warms the water when it’s time to clean up. At the moment when Energetic transition is discussed widely in European Countries, debating the switch from fossil energies to renewables, couldn´t the Middle East be leading the path ? In the Palestinian Territories, the idea is growing up widely. With 10% of energetic demand increase per year, the almost complete dependence on Israeli supply, its cost and scarcity, is pushing Palestinians, further than environmental concerns, for a precious energy security. In 2009, the Palestinian Authority spent USD 374 millions for energy, more than 95% of it being imported, mainly from Israel and with small amounts from Egypt and Jordan. 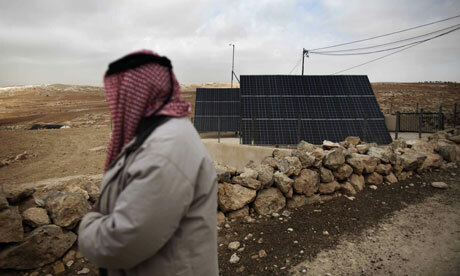 With the difficult financial situation for many inhabitants of the West Bank, many can not afford the high prices imposed on the imported kilowatt-hour ( about 15% more than in the US or in Israel)1.Meeting environmental issues with economical and political stress could well be an accelerator for energetic transition initiatives in the Palestinian Territories. (PCBS), over 60% of households were using solar water heaters, the highest rate in the region. (2) Firms such as MENA Geothermal, based in Ramallah, winner for the second time of the Energy Globe award (3), encourage an innovative system piping cool air from deep below the earth’s surface to provide air-conditioning in hot summer days. In rural areas, use of biomass (4) is widespread, and one can see the development of other renewable technologies, from wind energy plants to photovoltaic. the 150 000 Palestinians living in this land having to get an authorisation from Israel for any construction, including water and electricity networks. UN officials said that permits were allocated on the only 1% territory having an Israeli-approved zoning plan, « most of which [being]already built-up » …These barriers force the Green energy advocates to take benefit from the gifts of nature in an isolated and restricted environment, watching the spring up of wind and solar energy systems all around the region. Solar plants becomes a sustainable solution, but also, and beforehand, a desperate one : « Solar is our only choice because building is forbidden by the Israelis », says Aziz Muhammad Hadhalin, engineer and community activist in Um Al-Kher (7). when economics is at stake, only an increase in awareness for green issues within the population will help solving it.